I've gotten a lot of input the past couple of weeks regarding content for the workshop. Here is the outline of the content (actually, a condensed version of the final draft of the workbook's TOC). If you have any last-minute wishes, now is the time to speak up! - Technorati, why you should claim your blog in Technorati and what you should do next. BTW, the workbook is about 32 pages of step-by step instructions with lots of screenshots. What else do you want to learn or talk about in this workshop? Is your blog meeting your expectations? Your blog has the potential to be the most powerful marketing tool you have. This three-hour hands-on workshop will teach you how to get the most out of it. Most workshops consist if a bunch of lecture, some abstract exercises, and a workbook you take home and - let’s face it - will never look at again. This workshop is different. It is being held in a computer lab and is hands on working on your very own blog. You won’t just learn about search terms. You will build a list of search terms for your business. You won’t just learn about reputation monitoring. You will build a reputation monitoring mechanism for your business. You won’t just hear that you should be reading blogs. 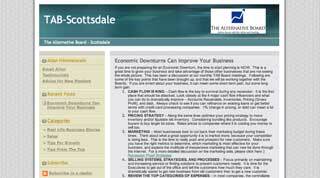 You will come away from this workshop with a list of blogs specific to your niche. Not only that during the workshop you will build the mechanism that you will then forever use to monitor those blogs using only a few minutes a week. You won’t just hear about using searches and RSS feeds to keep up with your industry and market, you will build your own custom driftnet stretched across the internet, capturing conversations on topics of interest to you, providing you with ideas for new blog posts, and identifying conversations you should participate in. There is nothing you will have to go home and implement on your own blog because you will have already done it in this workshop! Keywords and Search Terms - How to think like your customer and create search terms and keywords that get results for your business. Technorati Tags - What they are, how you should use them, and why you should care. Automated Search-Driven RSS Feeds - How to use free tools on the internet to locate conversations of interest and spend just a few minutes a week doing it. Monitoring Your Reputation - Use the same search driven RSS feed mechanism to detect when anyone mentions your name, the name of your company, website URL, etc. Learn how best to respond. Engaging the Blogosphere - Learn how to use Google Blog Search and technorati to find other bloggers speaking to the same audience you want to reach. Trackbacks - What they are, when to trackback, and why. Technorati - Why you should claim your blog in Technorati. Stats - Learn how to use the statistics information build right into Typepad and Feedburner. Social Bookmarking - Learn how to leverage this tool that could bring tens of thousands of visitors to your blog. Google Juice - The specific steps you must take to boost your Google rankings. There are only 12 seats in this workshop! This is your chance to learn how to unlock the true power of blogging for your business. With only twelve seats, you will get the individual attention you need to insure your success. There are only twelve workstations in the computer lab. When this workshop is filled, that's it! Don't miss out. I was talking to a friend who is the CEO of a multi-million-dollar company just yesterday. He was bemoaning the fact that he does not have a mentor or anyone to bounce ideas off of. He has nowhere to turn to discuss his problems and issues. He is a candidate for joining one of Allan's boards because their purpose is exactly that - to provide you with a peer group with which you can share and discuss ideas, challenges, and issues and learn from each other. 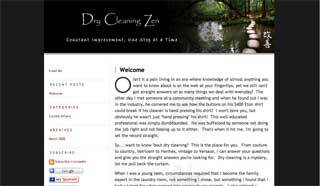 Business Blogging Pros welcomes EJ Kai and Dry Cleaning Zen as our newest client. EJ Kai is a thought leader in the drycleaning industry. I - who knows nothing about drycleaning - was fascinated. EJ wanted a platform to share his thoughts, views, and opinions with the rest of the world about dry cleaning. You will notice that Dry Cleaning Zen does not look like your ordinary Typepad blog. We have an outstanding graphic designer here at Business Blogging Pros. Frankly, she is the best graphic designer I have ever known. I have been looking forward to the opportunity to show off her talents. If you want a custom design for your Typepad blog we can do that for you very reasonably. 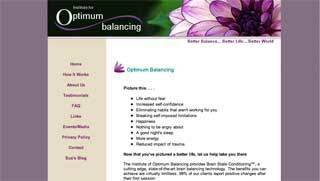 Business Blogging Pros Welcomes Sue Shipman and the Institute for Optimum Balancing as our newest client. This is Massage For Your Brain and it's cool. And it works.